Today is the May full moon for many parts of the world (including mine). In Asia and Australia it will be tomorrow because of the way time zones work. Because I am now using the blog to focus on movable festivals (those that move about the Gregorian calendar), there will be lunar celebrations here every month, especially those fixed to the full moon. The moons all have names in cultures that use a lunar or lunisolar calendar pegged to the name of the month they begin. In cultures that use solar calendars the names of the moons are associated with annual activities such as Harvest Moon or Hunter’s Moon. 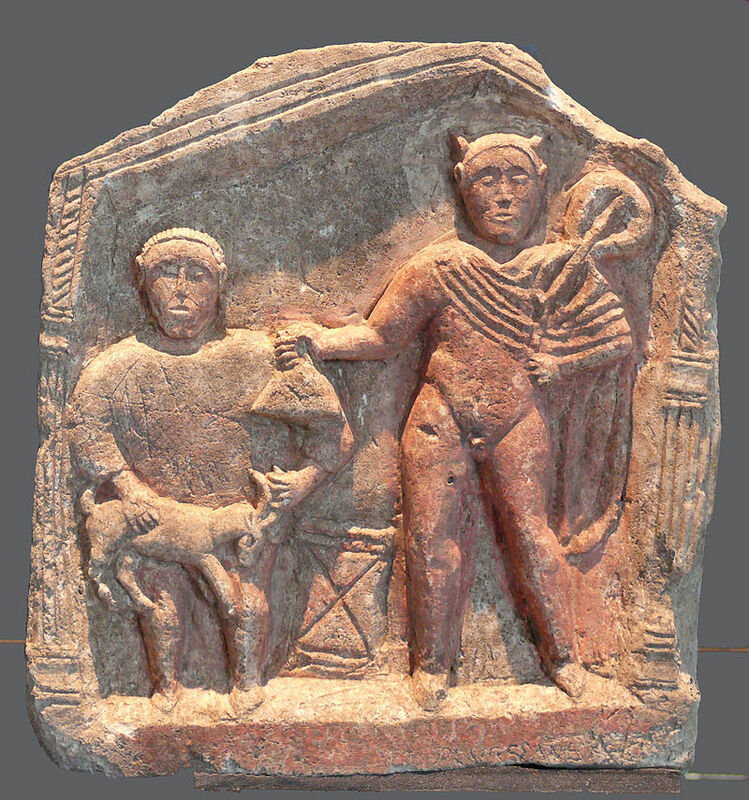 In Anglo-Saxon times the May moon/month was called Þrimilce-mōnaþ (Month of Three Milkings) in England. These days it has various titles — Milk, Grass, Corn, Flower, Root, etc. depending on the Almanac you choose. 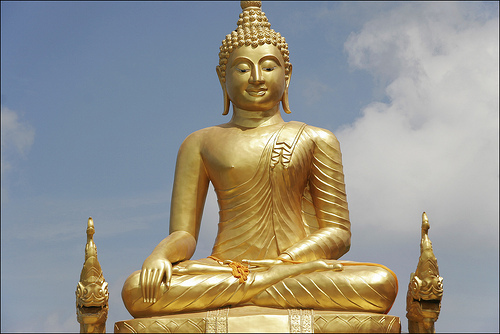 In Buddhist cultures, today is a special day reserved to celebrate the birth, enlightenment, and death of Siddhartha Gautama (563-483 BCE), usually known as the Buddha. In Japan the day is fixed on 8 April in the Gregorian calendar and I have already mentioned this tradition http://www.bookofdaystales.com/buddhas-birthday/ . In most Asian cultures, however, it is pegged to the lunar calendar and has various names, although the underlying significance is generally the same. For convenience I’ll use the Sanskrit name, Vesākha. 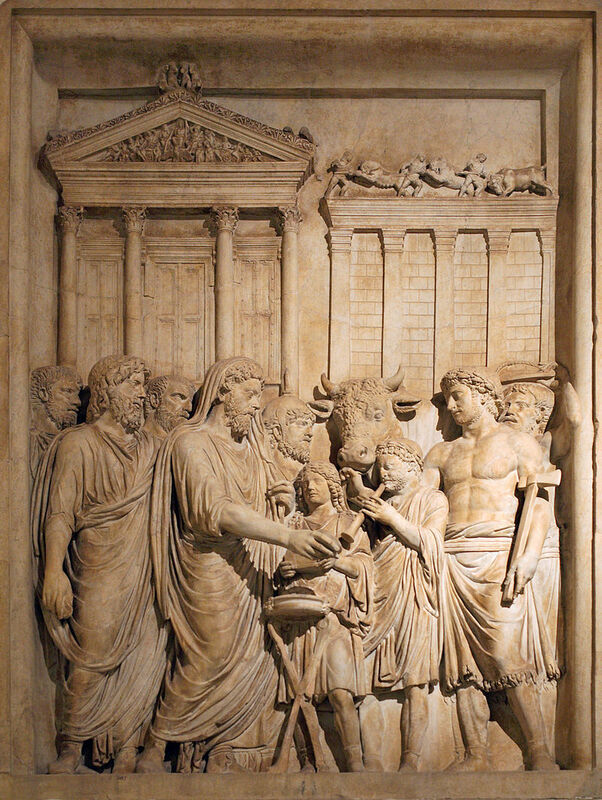 Tradition ascribes to the Buddha himself instruction on how to pay him homage. Just before he died, he saw his faithful attendant Ananda, weeping. 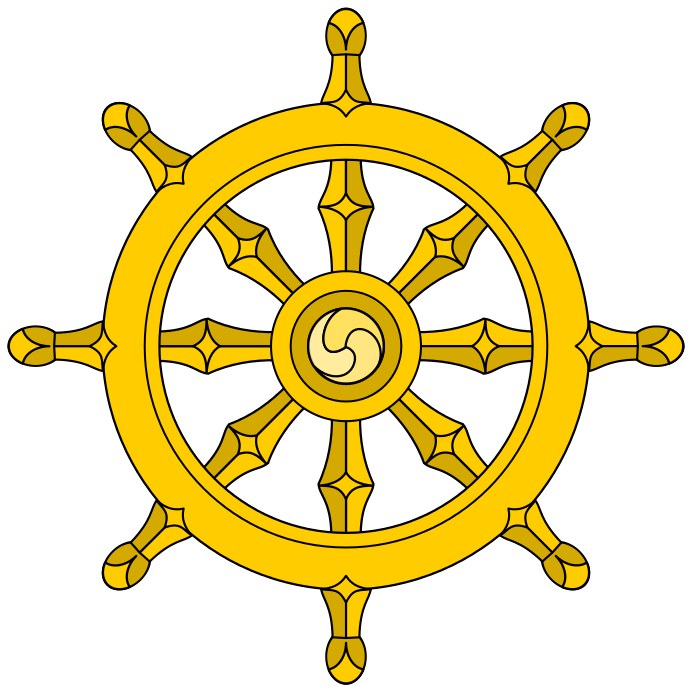 The Buddha advised him not to weep, but to understand the universal law that all compounded things (including even his own body) must disintegrate. He advised everyone not to cry over the disintegration of the physical body but to regard his teachings (The Dhamma) as their teacher from then on, because only the Dhamma truth is eternal and not subject to the law of change. He also stressed that the way to pay homage to him was not merely by offering flowers, incense, and lights, but by truly and sincerely striving to follow his teachings. This is how Buddhists are expected to celebrate Vesākha: to use the opportunity to reiterate their determination to lead noble lives, to develop their minds, to practice loving-kindness and to bring peace and harmony to humanity. 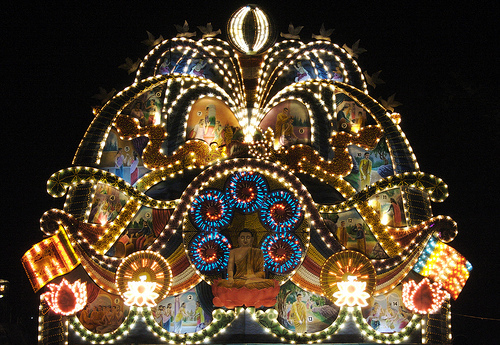 On Vesākha day, devout Buddhists and followers alike are expected and requested to assemble in their various temples before dawn for the ceremonial, and honorable, hoisting of the Buddhist flag and the singing of hymns in praise of the holy triple gem: The Buddha, The Dharma (his teachings), and The Sangha (his disciples). Devotees may bring simple offerings of flowers, candles and incense to lay at the feet of their teacher. These symbolic offerings are to remind followers that just as the beautiful flowers will wither away after a short while and the candles and incense sticks will soon burn out, so too is life subject to decay and destruction. Devotees are enjoined to make a special effort to refrain from killing of any kind. They are encouraged to partake of vegetarian food for the day. In some countries, notably Sri Lanka, two days are set aside for the celebration of Vesākha and all liquor shops and slaughter houses are closed by government decree during the two days. Also birds, insects and animals are released by the thousands in what is known as a ‘symbolic act of liberation’; of giving freedom to those who are in captivity, imprisoned, or tortured against their will. Some Buddhists wear simple white clothes and spend the whole day in temples with renewed determination to observe the Eight Precepts of Buddhism. 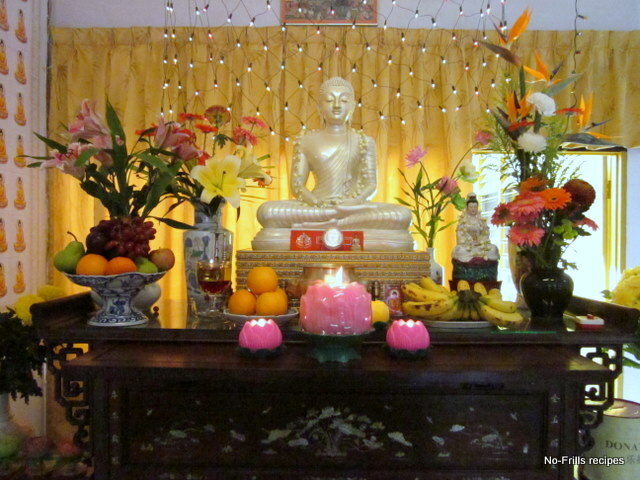 Some temples also display a small statue of the Buddha in front of the altar in a small basin filled with water and decorated with flowers, allowing devotees to pour water over the statue; it is symbolic of the cleansing of a practitioner’s bad karma, and to reenact the events following the Buddha’s birth, when devas and spirits made heavenly offerings to him. Devotees are expected to listen to talks given by monks. 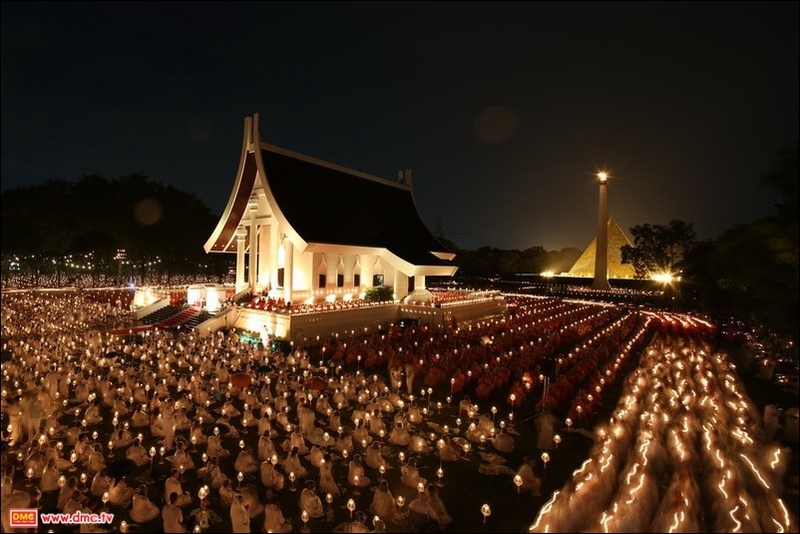 On this day monks will recite verses uttered by the Buddha to invoke peace and happiness for the government and the people. Buddhists are reminded to live in harmony with people of other faiths and to respect the beliefs of other people as the Buddha taught. Celebrating Vesākha also means making special efforts to bring happiness to the unfortunate like the aged, the handicapped and the sick. To this day, Buddhists will distribute gifts in cash and kind to various charitable homes throughout the country. Vesākha is also a time for great joy and happiness, expressed not by pandering to one’s appetites but by concentrating on useful activities such as decorating and illuminating temples, painting and creating exquisite scenes from the life of the Buddha for public dissemination. Devout Buddhists also vie with one another to provide refreshments and vegetarian food to followers who visit the temple to pay homage to the Buddha. 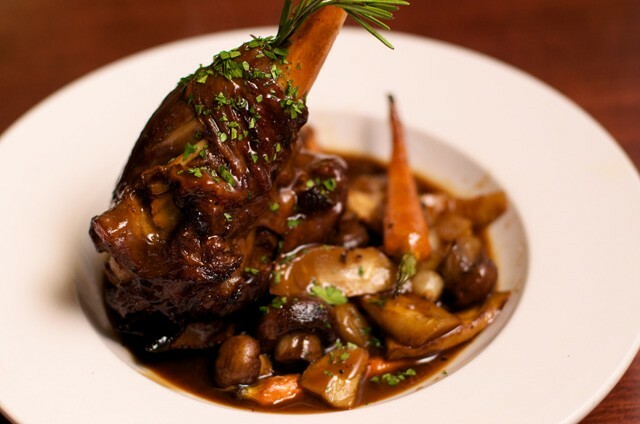 Collect the vegetables you want for the dish, making sure you have plenty of variety. Cut them all into bite-sized pieces. You’ll need cellophane noodles as well. Soak them in warm water until they are soft. 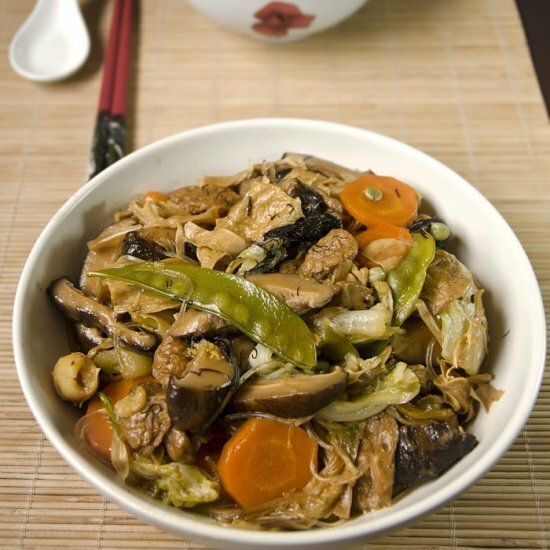 For the sauce prepare a mix of vegetable stock, soy sauce, sesame oil, sugar, and cornstarch. Stir fry your vegetables over the highest possible heat in a wok or skillet with a little vegetable oil. Add the noodles (with some water clinging) to heat through, then add your sauce, turn down to a simmer and mix all the ingredients and sauce together.